If the Bahamas wasn’t at the top of Galen Hall’s list of favorite destinations after winning the 2011 PokerStars Caribbean Adventure (PCA) Main Event, it could very well be by the end of Saturday. Hall is currently the chip-leader heading into the final table of the $100k buy-in 2012 PCA Super-High-Roller tournament, which will net the winner about $1.2 million! The final table of eight players, eight of the most well-known poker players in the world mind you, should have a very interesting dynamic since only five of those players will make the money. With the 5th place finisher receiving a minimum-cash of $250,000 the difference between finishing in 5th and 6th place in the event is mind-numbing $350k! Friday’s action proved that in this tournament no chip-lead is safe. Yesterday, Isaac Haxton, one of the chip-leaders throughout the tournament, crashed and burned at the end of the day, going from chip-leader to out in a matter of hands. Joining Hall at the final table are Daniel Negreanu (Negreanu finished second in this event last year, losing to his fellow Team PokerStars Pro and eventual BLUFF Magazine Player of the Year Eugene Katchalov); 2010 WPT Champion Scott Seiver; 2010 WSOP Main Event Champion Jonathan Duhamel (a recent victim of a violent home invasion); Epic Poker League Champion Mike “Timex” McDonald; the online enigma Viktor “Isildur1” Blom; as well as former hedge fund manager turned poker pro Dan Shak and Costa Rican poker legend Humberto Brenes (who like Negreanu also made the final table in this event last year). Perhaps the most interesting story developing is Blom (with Duhamel coming in a close second), who after an up and down career at the online poker tables is in search of his first major live tournament victory. In December 2009 PokerStars signed the anonymous online player known as Isildur1, and at last year’s PCA his identity was finally confirmed amidst much hoopla as Swedish phenom Viktor Blom. 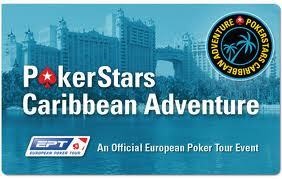 The PCA Main Event will also get underway on Saturday as the first starting flight is in action. Day 1b of the Main Event will take place on Sunday, with both starting fields combined for Day 2 on Monday. Other tournaments in action today include an 8-Max PLO Turbo tournament with a $5,000 buy-in and two Super-Satellites to the PCA Main Event with a $1,040 buy-in. This entry was posted on Saturday, January 7th, 2012 at 10:30 am and is filed under Poker News. You can follow any responses to this entry through the RSS 2.0 feed. You can leave a response, or trackback from your own site.